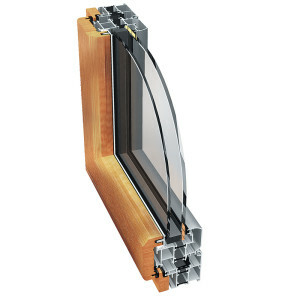 PONZIO PW 93 WOOD :: SIA "AMP Sistēmas"
The main characteristic feature is connection between wood and aluminium profiles with thermal insulation. Thickness of construction for frames and sashes increased to 70-93 mm, what improves the termal isolation of system. Various constructions can be made in this system: double sashes windows, tilt and turn windows, side hung casement windows. In PW 93 Wood used wood straps from tropical wood, which is good quality. It is resistant to weather conditions and present in a aesthetic way.